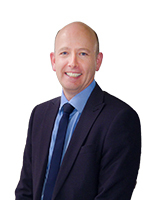 SSI Services (UK) Ltd (an infrastructure services specialist and part of South Staffordshire Plc) has signed a long term exclusivity deal to operate the UK license for Curapipe Systems Ltd, TALR (Trenchless Automated Leakage Repair) technology. Hydrosave – the pipeline management and leakage specialist within SSI Services, will operate the license and adapt the TALR deployment and site processes to meet the stringent requirements of the UK water industry along with the complexities of its established networks. Originally developed in Israel, the TALR technology has been tested extensively to repair leaks by the Jerusalem Water Utility and it has been trialled in both Italy and South America. TALR works by inserting a ‘gel type pig train’ into a section of isolated pipe using a special deployment station via an existing fire hydrant or tapping position. 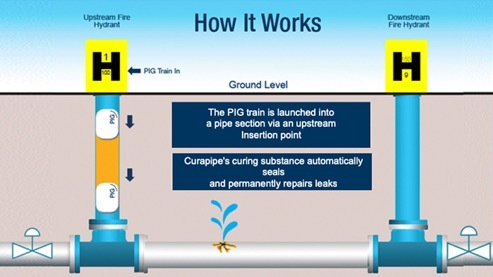 The ‘pig train’ moves under pressure along the pipe at a controlled velocity and instantaneously seals all types of leaks with a special material which then hardens becoming structurally integrated into the pipe. The pig train is removed from the pipe using a specially designed retrieval system. “We simply couldn’t ignore the opportunity to work with Curapipe and we are delighted to conclude our deal having worked closely with them over the past 12 months. Together we will form a great team as we complement each other’s skills sets. This repair process is an innovation that will transform leakage reduction and help the sector drive leakage to lower levels”. “Water companies have committed to ambitious leakage reductions in their new business plans and UKWIR have set a tone for zero leakage. It is important that companies like Hydrosave continue to innovate and adapt to exceed the outcomes of these business plans. We are pipeline management experts focussed on the prevention of bursts, improved asset performance, enhanced leak awareness and detection techniques. With Curapipe, we have the potential to not only repair leaks, but also to enhance pipeline performance for longer periods”. “A bulk leakage reduction system using an innovative repair technique is a ‘game changer’ and when applied in the correct circumstances the Curapipe TALR process is revolutionary for our leakage reduction strategies. We have proven this innovation is effective in repairing many types of leaks, including weeps from fittings, cracks, small fractures and corrosion holes. We have two training and demonstration sites, DWI approval is in place, and over the next 6-12 months we will be working on the methodologies to refine the pre- and post-inspection and application processes. The project to embed this as a new service in the UK is not without its challenges, but I believe we are the best equipped business in the UK to help come up with solutions to optimise the field delivery process on site”. “We already own several industry patents, partner several new technology companies to enhance Smart networks, have funded research for leak detection on plastic pipes and for several years we have sponsored a national water dragons innovation event with Future Water Association. With this Curapipe license we have invested in the future and, to some extent, we have taken a risk that our sector is open to new ideas. We believe the timing is perfect for something new”. At this early stage of the innovation process, Hydrosave is now looking to engage with prospective water company clients. The intention is to hold initial user requirement design meetings to discuss how best to optimise the deployment and use of this unique ‘Trenchless Automated Leak Repair’ process.